We take pleasure to introduce ourselves as one of the renowned firms for providing the best-in-class range of Brass Turned Component. Leveraging on our extensive market knowledge, we are providing a high-quality range of Brass Precision Components. We are one of the well-known business organizations in the industry that manufacture and supply a huge variety of Brass Components. These components are manufactured using premium grade raw material, which is obtained from trusted vendors. Furthermore, keeping needs of various industries in mind, our professionals design these products in variety of specifications. - Finish and Coating: Natural, Nickel Plated, Tin Plated or any coating as per customer specification. Our specialists hold expertise in exporting an exquisite range of Brass Turned Parts to the clients. Available in variegated specifications, our range is used for various kinds of engineering, mechanical and automobile applications. These products are designed using optimum grade brass and advanced methodologies at our production unit. We introduce our business as a notable entity of qualitative array of Automotive Brass Part. 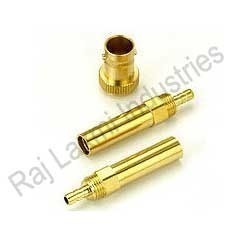 We are Leading Brass Precision Components Manufacturer from Chennai.